Wisdom of Life. : Mount Kinabalu here i come. Have you climbed mountain before? I have not but after listening a mountain climbing story from KM Lee, I am considering to climb one. KM Lee is a 54 years old businessman, who was encouraged to climb Mount Kinabalu recently. 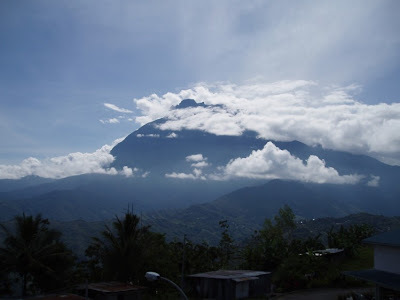 Mount Kinabalu is the highest mountain in South East Asia, and one has to be fit and strong to conquer the peak. Lee was the oldest among his group of young climbers. Prior to this climbing, Lee is a hatch runner who believes he had the stamina to scale the scary height. He was only worried whether he had the determination and spirit to reach to the top. On the day of climbing everyone was excited with full of enthusiasm. They promised each other that all would make it to the final. Half way the journey, everyone was breathing hard, especially when the air was getting thinner and the temperature was cold. As Lee was the oldest, he wasn't afraid that he could not make it, but he was more afraid that he was going to be a burden to the group. Rather being left out on the walking path behind, he walked and moved faster than the younger team. Without him knowing, his fast pace and speedy run, spurred the younger friends to run faster as well. The older climber did not want to burden the young, and the younger climbers were too embarrassed to loose to an older climber. Because of this mental pressure, it created an extra energy and determination to all these highly motivated climbers. They reached the top faster than expected. Lee was third to reach there too. Moral of the story; Success is easier when the young and the old meet and work together. There is a German Proverb - "The old forget, the young don't know".